"Fisher Island and Fisher Island Slough, Washington"
Click image to enlarge West side of Fisher Island, Washington. 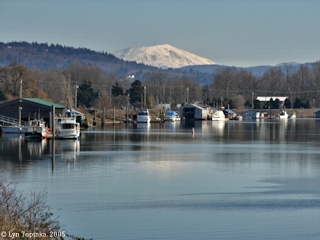 Image taken January 2, 2005. Fisher Island is a 1.5-mile-long island which hugs the Washington side of the Columbia River, just downstream of Longview, Washington, at Columbia River Mile (RM) 59 and 60. Fisher Island is separated from mainland Washington by Fisher Island Slough. 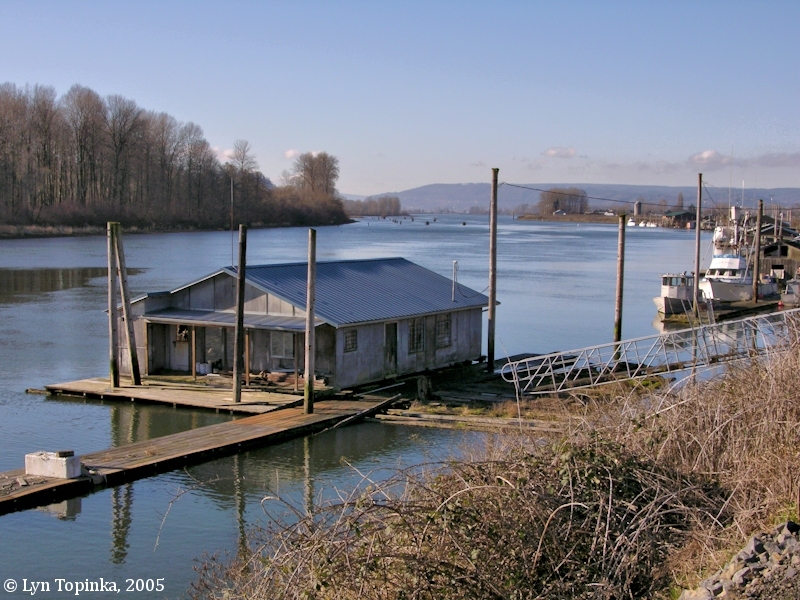 Immediately upstream and partially bordering Fisher Island Slough is Willow Grove. On the south side of Fisher Island is the man-made Hump Island. In 1997 the Washington Department of Fish and Wildlife and Ducks Unlimited purchased Fisher Island from Lloyd Ewing, who lived there in the 1940's. Fisher Island is an important nesting site for waterfowl and other birds. The island shelters more than 100 great blue heron nests in its thick vegetation and is widely used by bald eagles as well as ducks and geese. Fisher Island Slough separates Fisher Island from the Washington mainland. Lewis and Clark pass Fisher Island on November 6, 1805. The "high clift on th Lard Side" is Green Point, Oregon. On their return in 1806, the Corps passes Fisher Island on March 26 on their way to Walker Island, Oregon where they camped for the evening. Fisher Island and Slough were named after George and Catharine Fisher, early homesteaders. Lewis and Clark pass Fisher Island on November 6, 1805, and again on their return on March 26, 1806. In 1841, Charles Wilkes, of the U.S. Exploring Expedition called today's Fisher Island "Plumondon I.". According to Edmond S. Meany in his Origin of Washington Place Names (1923), Plumondon was a retired Hudson's Bay Company employee. 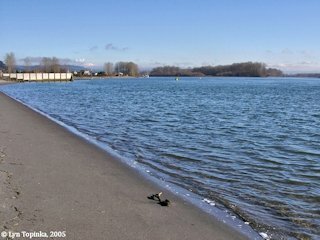 Also plotted on Wilke's map was an unnamed smaller island just off the downstream tip of "Plumondon Island", and right off the shore of todays Willow Grove, approximately in the location of the Willow Grove Beach boat launch and park. Wilkes labeled the downstream tip of today's Willow Grove as "Wala Pt." 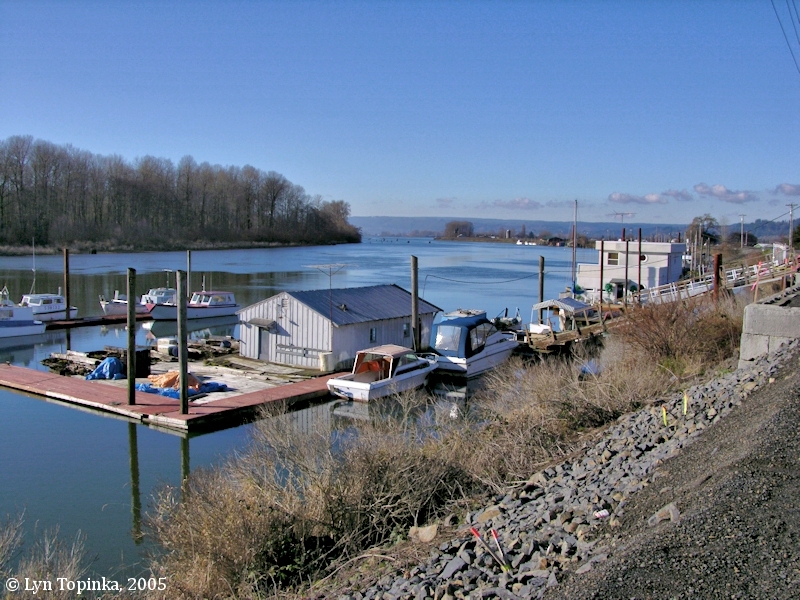 (where Coal Creek Slough enters the Columbia River). 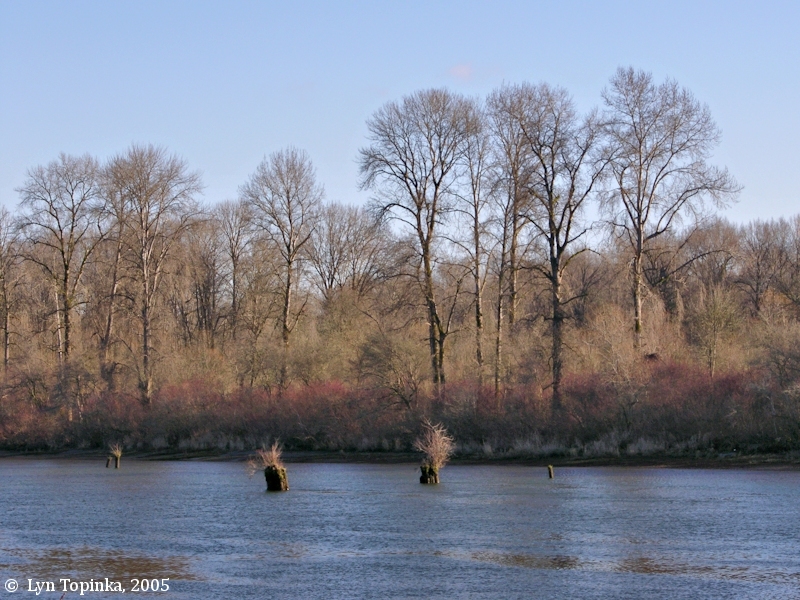 Coal Creek Slough was called "Wala Creek". Fisher Island Slough was not named. On an 1854 Government survey, this smaller island was called "Fishers I. ", while today's Fisher Island was called "Elizabeth I.". Willow Grove and Fisher Island Slough were unnamed. The 1858, 1863, and 1873 U.S. Bureau of Land Management's cadastral survey maps (tax map) shows today's Fisher Island labeled "Elizabeth Island", while a small island to the north (near today's Willow Grove) was known as "Fishers Isl. ", "Fishers Island", and "Fishers Id.". This small island today is part of Willow Grove. The 1860 Federal Census (courtesy "usgwarchives.net" and the Washington State Archives) lists the Fisher family: G.W. Fisher, age 43, Lumberman, born New York, Catherine Fisher, age 33, born New York, James Fisher, age 20, born New York, Catherine E. Fisher, age 14, born Illinois, George E. Fisher, age 12, born Illinois, Judith E. Fisher, age 10, born Illinois, Mary J. Fisher, age 8, born Oregon, Charlotte E. Fisher, age 5, born Washington Territory, and Baby Fisher, age 5 months, born Washington Territory. The U.S. Bureau of Land Management's General Land Office Records database (2017) shows Catharine A. Fisher and George N. Fisher being granted title to 319.75 acres of T8N R3W, parts of Sections 21, 22, and 27 on August 27, 1871 (1850 Oregon-Donation Act). This are includes the island today known as "Fisher Island". The 1888 nautical chart "Columbia River, Sheet No.4, Grim's Island to Kalama", has the small island near Willow Grove unnamed and beginning to merge into Willow Grove, at a point labeled "Cleaveland's Ldg.". The former Elizabeth Island was labeled "Fishers I." and Fisher Island Slough was labeled "Fishers I. Channel". Massive sandbars are depicted in the area of todays Hump Island. 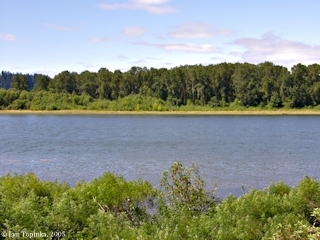 Coal Creek Slough is unnamed. "Grim's Island" is today's Crims Island. The 1888-89 U.S. Commission of Fish and Fisheries, "Chart of the Columbia River from the Ocean to Portland, Oregon Illustrating the Condition of the Salmon Fishery, Season of 1888-9" once again has Crims Island labeled "Grim's Island". Coal Creek Slough is called "Big Slough", and the approximate location of today's Willow Grove Beach is labeled "Cleaveland's Land'g". Fisher Island Slough is "Fisher's I. Channel" and Fisher Island is labeled "Fisher's I.". The small island still exists off of Willow Grove and is unnamed. 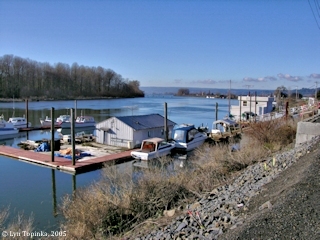 Salmon weirs are depicted off of the unnamed island, and upstream of today's Willow Grove Beach. In 1891 and then again in 1915 (NOTE: the "decision card" in the database has the date 1915 however elsewhere in the database the date 1905 is used) the U.S. Board of Geographic Names made "Fisher Island" official. In 1959 the U.S. Board of Geographic Names made "Fisher Island Slough" (channel between Fisher Island and Washington State mainland) and "Fisher Island Channel" (main shipping channel in the Columbia south of Fisher Island) official. Click image to enlarge Fisher Island, Washington. Fisher Island Slough is in the foreground. Image taken July 28, 2005. 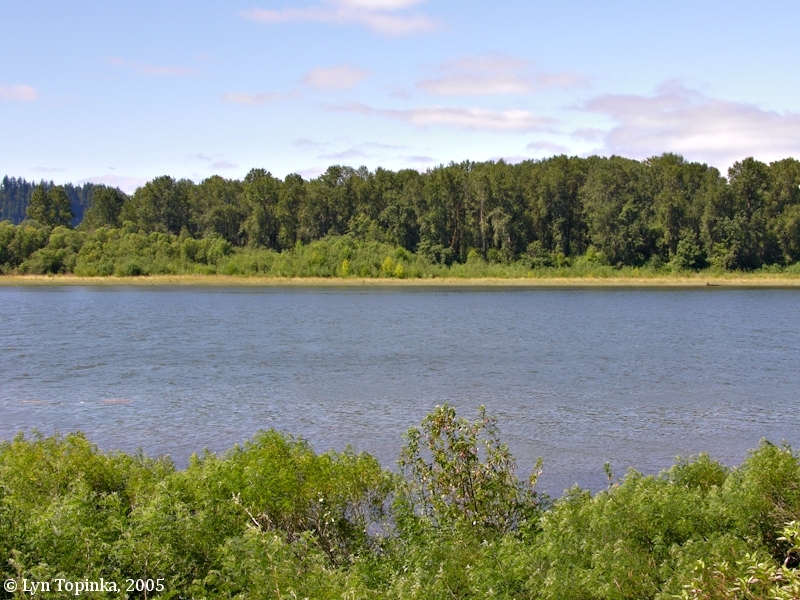 Click image to enlarge Fisher Island, Washington, downstream tip. Fisher Island from Willow Grove Beach. Image taken January 2, 2005. 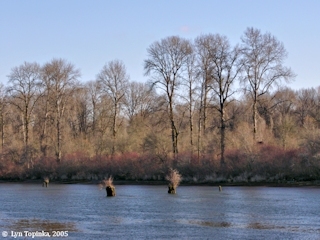 Click image to enlarge Fisher Island Slough, Washington, looking downstream. Fisher Island is on the left. Willow Grove is on the right. Image taken January 2, 2005. 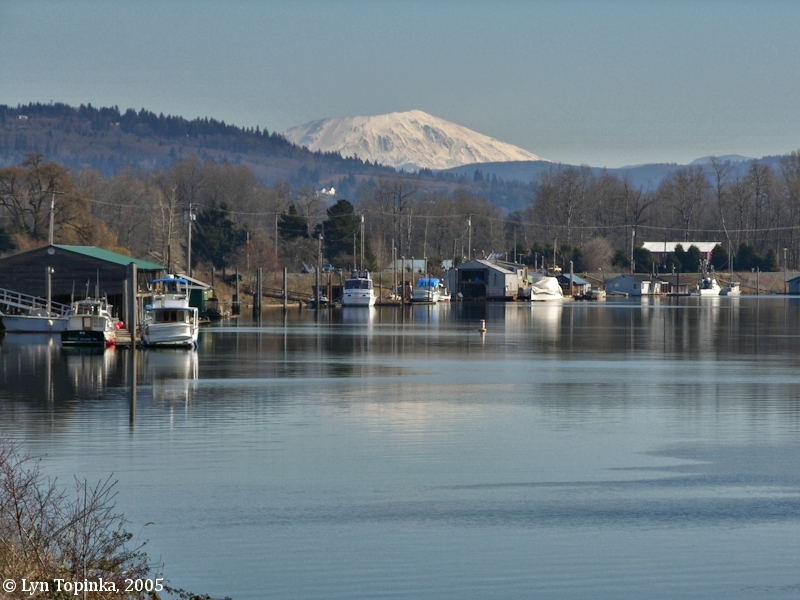 Click image to enlarge Mount St. Helens, Washington, and Fisher Island Slough, Washington. Image taken February 21, 2005.